Gratitude can change your perspective on the simplest of mundane tasks and transform them into moments of sudden glory. Click & Tweet! One day I was mopping the kitchen floor and my mood was anything but grateful. I grumbled with each push of the mop. Complained with each dip in the bucket. Then right in the middle of the kitchen, God showed up. Actually, He was there all along, but my grumbling blinded the eyes of my heart to recognize His presence. New thoughts began to emerge as I pushed the mop across the linoleum floor. I believe God put them there. Suppose you were blind and you couldn’t see the beautiful patterns on the linoleum floor or the spilled juice by the refrigerator door. Suppose you were deaf and you couldn’t hear the soothing sound of the soap bubbles dissolving in the scrub bucket or the rhythmic sound of the mop being pushed back and forth across the floor’s hard surface. Suppose you were in a wheelchair and you weren’t strong enough to stand upright and grasp the wooden handle in your nimble hands to erase the muddy footprints and make the floor shiny and clean again. Suppose you didn’t have a home or a family to clean up after. Lord, the words of Romans one strike me to the core. May I never forget to give thanks to You. Everything I have is because of Your grace in my life. Forgive me when I complain. Forgive me when I am discontent. Thank You for Your many blessings. In Jesus’ Name, Amen. Leave a comment and tell me one thing you’re thankful for today. Congratulations to M.P. Gongalez for winning the free copy of A Sudden Glory from last week’s post! Thank you go that reminder instead of grumbling be grateful as I was doing just that as I was cleaning mud from my sons boots all over the floor. I will definitely change my mindset and be grateful that I am capable physically to clean it up. You will not see me circling a parking lot to get a closer spot. As my dear (and blind) Granny would say, we are thankful for being able to walk the distance. What a bonus if it was a beautiful day, too. I’m thankful that I clean up empty coke cans and water bottles and not empty beer cans or wine bottles!! I used to complain about cleaning them up but my husband pointed out to be thankful they had coke and water in them and not beer and wine!! I never have complained again!! Wow Sharon! This topic hit home for sure for me! I am blessed to have a family. I was not suppose to have children and I have 2! God is Awesome! I am going to print this article and put up at work and on my refrigerator. If it wasn’t for our dear God and his Amazing Grace, we would t have anything! Thank you God for all you have done and all you have given me! I’m truly thankful for God’s forgiveness, long-suffering, mercy, grace, thoughts towards me, goodness and His unconditional love for me everyday! Definitely thankful for my health that I’m able to work every day. I clean houses for a living and this was a great devotion for me. So thankful to be able to do this. This happened to me yesterday, thank you for your encouraging words . When i feel like complaining i will think back at this. Thank you Jesus for your mercy & grace . What a great reminder to be thankful for what we take for granted each day. I am grateful for my scars from a double mastectomy and an abdominal tram flap reconstruction. I am a 21 years breast cancer survivor. Praise the Lord! The scars also remind me of the scars Jesus had when he was beaten and hung on the old rugged cross! Thanks for your ministry. You’re a blessing to many. Yes, I’m the one from Fuquay-Varina, NC. I am thankful that my daughter and grandson moved in with us. It’s a very difficult situation, but trusting God with manna for each day! Yes, Sharon thank you so much for this devotion this morning. Wow to appreciate all that God has given us is so important . Like you said thanking God for your senses to do things. Thanking God for a home and a family. So I pray that today at least I will keep in mind that things don’t have to be as good as they are. Thank you Sharon and of course Thank you Lord! Thank you for this today. I actually am the custodian for our church and our church hosts our community soup kitchen every Tuesday. So after every Tuesday, I am responsible for… mopping the gym, by regular mop and bucket. And this just hit the nail on the head because sometimes it’s hard to do it but it’s more than mopping a floor, it’s serving Him and His people. Thank you again. I am thankful for having the freedom to praise God. Friday, October 26 marks the one year anniversary of my sweet mother’s Homegoing to her Heavenly Father after a long battle with dementia/alzheimers. While memories this week bring sadness that she is no longer here, I am thankful for the ways that God is gently reminding me of His presence during this time a year ago. He truly was my peace and strength as I received the call to “come now” from the hospice nurse and traveled the 5 hours alone. He opened up the interstate as I drove through rush hour traffic, a kind server at McDonalds ordering a pumpkin spice latte, prayers offered on my family’s behalf by many people including an unexpected phone call from someone who had no idea what was going on. The seven years were long and hard, but my mother remained sweet. I am so thankful that she introduced me to Jesus. THANK you, O Lord, for waking me up and giving me another day. I’m thankful today for emails that come from Girlfriends In God – your words speak right to my heart just when I need to hear them. I will never mop my kitchen floors again without thinking about this message. I thank God for your words,the ability He has gifted to me to read them, and His grace that gives them meaning to my heart. Thank you for listening to His calling. Thank you LORD for giving me sight to read this, the mind to understand and the put concentrate on it, the strength to scroll through it, the bundles to browse, the ability to understand and behold the beauty of the message. Thank you LORD. I needed to hear this today . Lord help me not to complain but to give thanks to you everyday for all things . We are very blessed & sometimes I take it for granted .. Thank you for your timely reminder. I work for The Salvation Army and we just completed our WM Retreat in Oregon. I had several women mention you as we were reminiscing about past speakers at our retreat. Thank you for investing in the lives of women everywhere. I am thankful to God for life, when I was growing up there were 7 of us in the house including my parents and siblings…..now there’s just the 2 of us, myself and my brother. So I am ever so grateful just to be alive one more day to Thank God and do His will! Thank you Lord for my washer and dryer in my home to do all the laundering that it does! Thank you for this, Sharon! 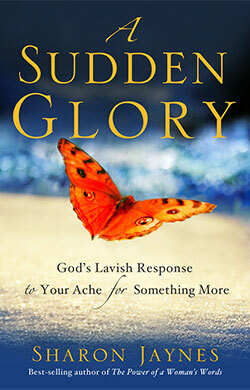 I am reminded about the grumbling I do and not receiving the appreciation I want… what about what God wants? He wants His name to be praised, He wants gratitude for His faithfulness and goodness, He wants His child to be blessed and not withhold those blessings because of my inconsiderate thoughts. Thank you again for this timely message; I will sing of His praises!!! I have kept a gratitude journal, listing 5 things daily, for 21 years. This simple act has truly changed my life. And yesterday, I added Sharon Jaynes’ Enough. I’m thankful that the Lord saved me. Thankful for my Bible ( which I often take for granted) Thankful for my wonderful church family and our sweet pastor. Thank you for this timely devotion today as I am in the process of washing my dirty kitchen floor which is my most hated job. It has changed my perspective! I’m grateful for a husband that treats me well and loves me. Thankful for Hurricane Michael that forced us to live in tight quarters for two weeks…it was an inconvenience but to tell the truth I loved being that close. Makes you realize what’s really important. This morning I wake up thankful for the stars I can see in the country sky. For our warm home in cool temperatures. For a clean and safe house, healthy food, a loving husband and healthy daughter. For God’s grace and new mercies again today! I am thankful for a beautiful home to clean. Two years ago we lost our home and every possession we had in a fire which was later deemed arson. (The police did find the culprits.) God provided so beautifully through the whole situation. He replaced our home and more than enough possessions – now as I dust and vacuum – I see gifts from friends and God’s provision everywhere I look. Through the horrible situation, we met many new friends and saw more blessings than we could have ever imagined. Your teaching today reminds me of something I try to think about when I feel discontentment over a mundane, seemingly thankless task. Not I have to but I get to. It changes my perspective from a burden to a privilege or blessing. Doing a sinkful of dirty dishes reminds me that we have food to put on the table. Running errands reminds me that I have a reliable car to take me from place to place. Doing the laundry reminds me that we have clean clothes and plenty of them. We enjoy so many things that others do not have. 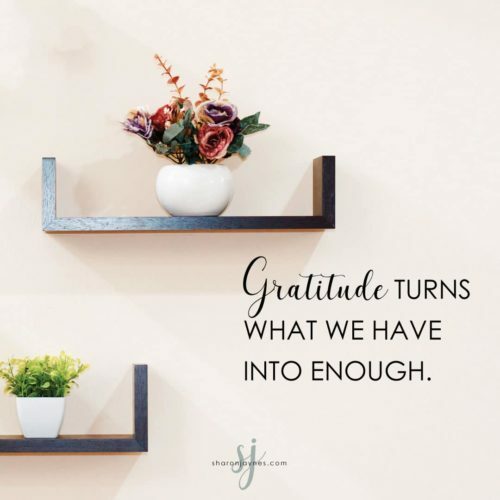 Gratitude does turn what we have into enough. Thanks for the reminder. I just finished wiping down kitchen cabinets, doors and baseboards. I’m thankful for Mr. Clean magicerasers that make this job so much easier. I am so thankful for Gods traveling mercies. He takes care of every detail. I am thankful for the good people in my life who have helped me through this illness. I am thankful for the dirty dishes in my sink, I know that my family is well fed. I am thankful that I woke up this morning, 2 years ago that was not on my horizon. I am so thankful for the house I moved it. I complained of things it needs, new blinds, pressure washing, etc. But I thank you God that I have a roof over my head. I am thankful for the basket full of dirty clothes to wash.
Thankful for the spirit of God that in dwells inside me! Rescued me from the pit that I was in for a year! Thank you dear Jesus ! On All Saints’ Sunday today, we saw photos of the saints from our church who have died up on the screen. One of those people was my mother. She died on May 14 of this year. As I saw her joy-filled face, it reminded me of who she was, and what she meant to us and everyone she met. I’m so very grateful for the woman my mother was – to me, yes, but also to so many more. She brought joy and laughter into a room when she spoke, she gave confidence and courage to those who were struggling, and she sang like an angel until just a few years ago. When she died, she was 98, and the morning of her death, she prayed with an aide and asked the Lord to take her home. “I’ve done all you asked me to do, Lord. Please take me home.” The Lord was prompt, and took her that night after dinner. Regardless of how often I stopped to see her, or what she felt like physically, she always had an upbeat word for me, a hug, and a kiss. I’m not sure how to really show the Lord how grateful I am for her (and my father). She raised me to respect others, love God, and go at life with gusto! What a wonderful gift!